The FURO waitress robot is the latest thing in robotic restaurant service bots from South Korean robotics company Future Robot. FURO (short for Future Robot) uses its sensors to detect when a customer comes near; it can even demonstrate friendly emotions to keep customers coming back. 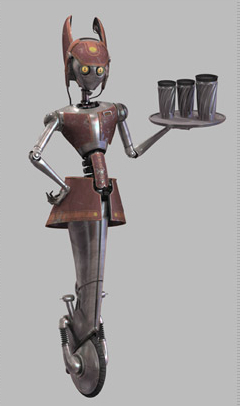 Star Wars fans of course remember the waitress robot WA-7, the friendly robotic waitress from Dex's Diner in Star Wars II Attack of the Clones. Find out about more real-life robot waiters and waitresses.